Petit pois dip with mint and goats cheese and garden stories. It is time for nature. For long walks. For the garden. Double digging and planting. For pruning and sowing. And for observing. After a hard winter, nature is on the verge of exploding into its exuberant spring plumage. To harmonize with the new growth and hope springing up all around, I wanted something green. 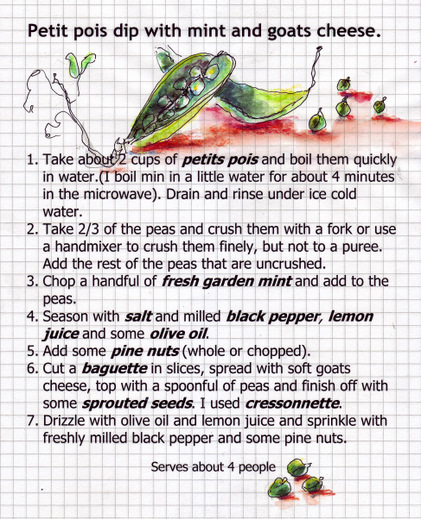 Petits pois came to mind with its vibrant green . I call it a dip, but it is a spread, a paté, a guacamole, a tapenade too… I added Maroccan mint, some freshly sprouted seeds, soft goats cheese; it is early spring on a bruschetta. Nothing more can be said. In a next post, we’ll talk a little about sprouting seeds, which is something we all should be doing at our homes! Instead of serving the dip on bread, it can be served in individual small glasses or bowls and eaten with a spoon as a starter and some bread on the side. Or serve as a little salad on a bed of young spinach leaves. Add some dried currants for a little sweetness. Use other vegetables like fava beans or a mixture of the two. Consider also crushed steamed broccoli or steamed courgettes. Don’t skimp on the mint. Some mayonnaise or cream can be added to the mixture to give it more of a dip texture. Serve with carrot and celery sticks. Serve with toasted bread slices or fresh crusty baguette slices. Let’s put winter with its deep conversation and full bodied Cabernets and hypnotic fireplaces behind for a while. Let’s move outside to the stories of nature. To the optimistic nesting of the gulls on the Loire islands. To the plunging flights of the swallows. The fearless circling of the eagles. Let’s focus on the delicate entrance of the apple blossom. The almond blossom. Let’s admire the elegance of the magnolia and not shy away from the shameless flirtation of the sweeping wildflowers. From the beginning of time, man had been entranced by nature. Living by it, dying by it. Cursing by it, loving by it. We live by it force every day. 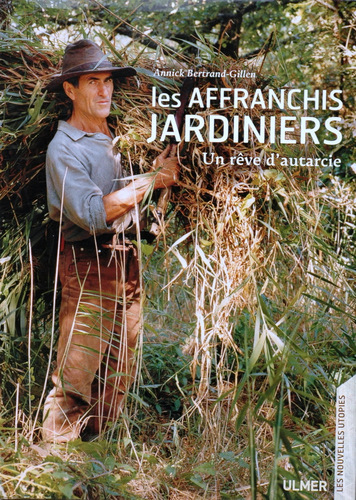 …Les affranchis jardiniers by Annick Bertrand–Gillen…..a couple living the simple way, providing for themselves from nature, doing it all the biological way. I adore this book.We experience a bit of their life with them, their garden and home and it gives us envy to follow in their footsteps. A beautiful life. A beautiful garden, open to the public in summer…. 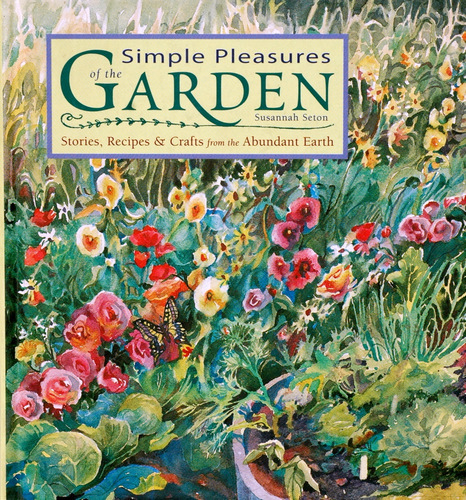 …Simple pleasures of the garden by Susannah Seton…...a collection of stories and recipes, quotes and tips for every season. This is a book to be read outside in the shade of the walnut, or curled up by the fireplace, or in the splendor of autumn by the riverside, it makes you love every season. 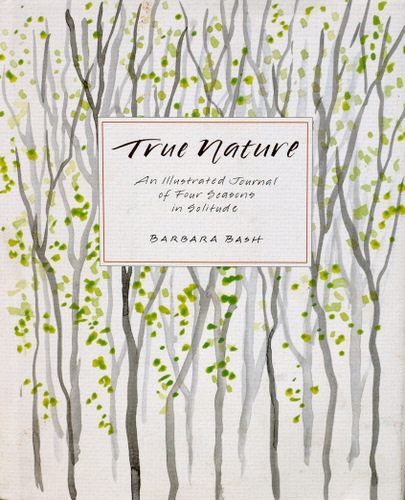 …True nature by Barbara Bash…..a writer/illustrator taking solitary retreats, living close to nature with only her thoughts and art and her journal. I received this as a gift from a good friend an fellow artist, the very creative Lindsay who sent it to me when I was not in the best of places. It was wonderful food for my thoughts then and still is! And last but not least…have a spring inspired look at Jain’s day inthe country! Don’t throw outt the water you’ve used to boil your eggs in. They are rich in mineral salts…use it to water your plants with. Previous Article Mackerel paté and creative recycling. Next Article Mini carrot loaves and Easter spirit. A simple, beautiful and perfect recipe for the season, and a gorgeous picture to feast the eyes on! 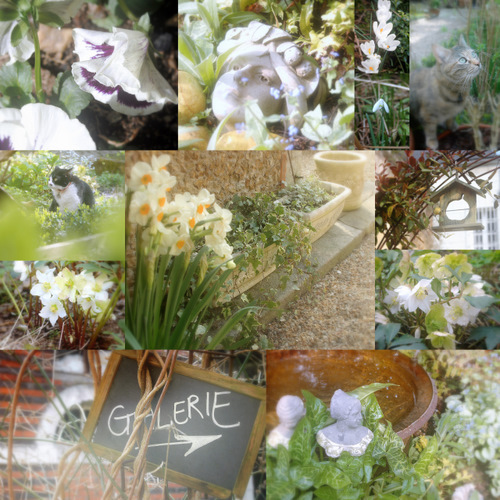 En plus de ta superbe recette fraiche et sa petite carte recette aquarelle….Tu partages des pensées de printemps et jardinage..ainsi que tes belles photos..
Je dois admettre qu’en voyant le titre ” Les Affranchis Jardiniers”..j’ai tout de suite pensé a toi et ton mari..
et mes petits souvenirs..ce fut la petite larme à l’oeil. Tu es remplie de talents.. Thanks for this tasty recipe & for those lovely prints & tips! I allways enjoy your lovely posts! I always enjoy reading how people move from one season to the next. My créme fraîche came out delicious and we are having the salmon tonight…..can’t wait! Wonderful tips Ronell!!! I never new that about the egg water. so interesting. 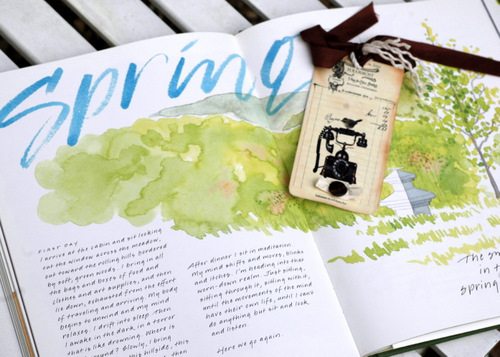 lovely books, recipes and sketches! Oh lala where oh where did my post go? I had thanked you for this lovely billet..I had said it was uncanny how some of our things matched! 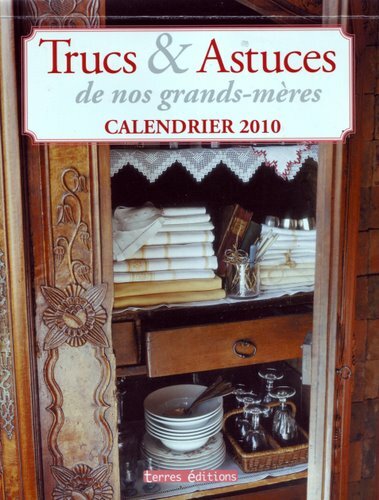 I had remarked(in French) that the book of Les Affranchis Jardiniers reminded me of you and your husband..and how I loved him braiding her hair. La recette avec l’aquarelle correspondante.. 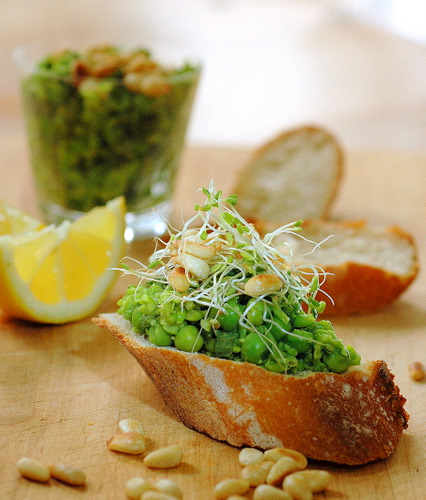 I love peas.Pine nuts.. baguette..etc.. They are the Irish/British imported ones.. I will be on a mission as soon as I can..We have hundreds of stores.. a bit away..one walking distance..that’s the one I checked.. This post will bore you if ever the one I typed this morning resurfaces..
Wow–this post was a feast for all the senses, Ronell! I love it. 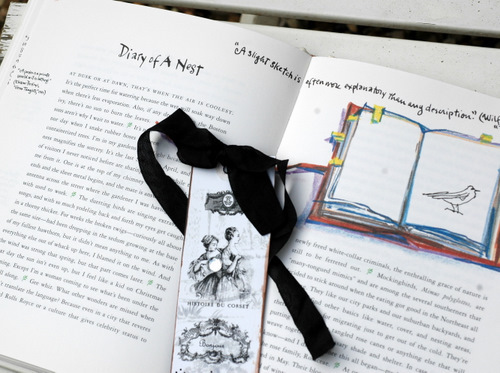 Great food, beautiful presentation, and these books and lovely bookmarks are gorgeous. What a delight. I’m so ready to make that recipe: it sounds delicious. 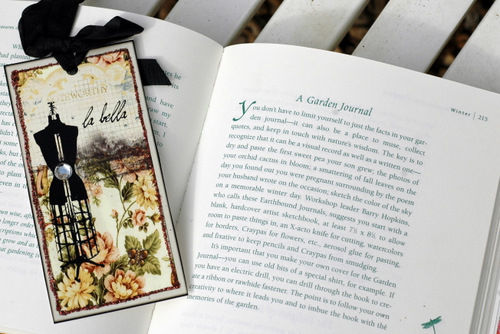 Gardening, lovely books, beautiful art, good food…all of these are good for the soul as well. Happy spring, Ronel! whoops–I misspelled your name–hit the “submit” key a tad too soon, Ronell–sorry! 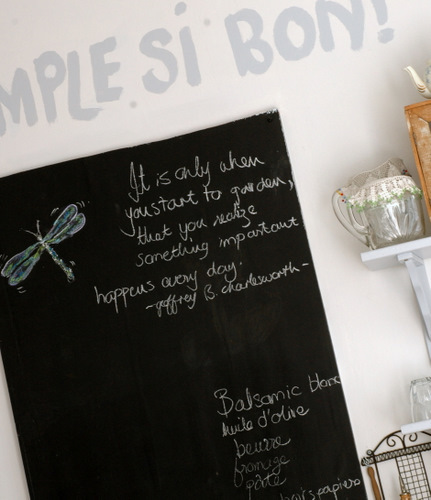 I love the garden quote on the black board, it is so true! The picture of the man plaiting the woman’s hair is priceless(I assume it is not yours). I am ready though for fireplaces and full bodies reds!!! Happy spring and the recipe is on the list for this weekend…. Mm, super delicate. I just moved to Paris and I’m trying to learn how to cook some French food, so your blog is really great for me! Your dear friend Gillian introduced me to you wonderful blog – I’m excited to have a new, gentle spot to visit with someone that loves goats cheese! Awesome! Ronelle, your posts always inspire me. I had just bought fresh peas, and have been spending long days in my garden, tidying it up and setting out young seedlings. Reading your blog is like sitting down with a cup of fresh tea with a friend and admiring the day’s work. 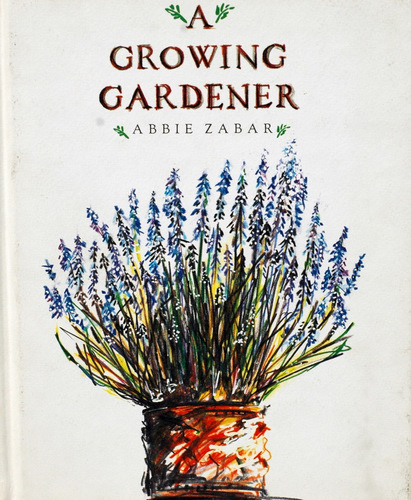 Abbie Zabar’s book is one of my very favorites! I’ll have to check out your other suggestions. Oh les petis pois frais! quel délice! elle m’a l’air délicieuse ta tartine, c’est vrai que rien n’est plus relaxant que de jardiner, c’est le moment vu que le printemps arrive à petits pas, il a eu du mal à sortir cette année on dirait! thank you for your visits and comments and encouraging thoughts…also those who send their support and encouragemtn by email…I appreciate every one! 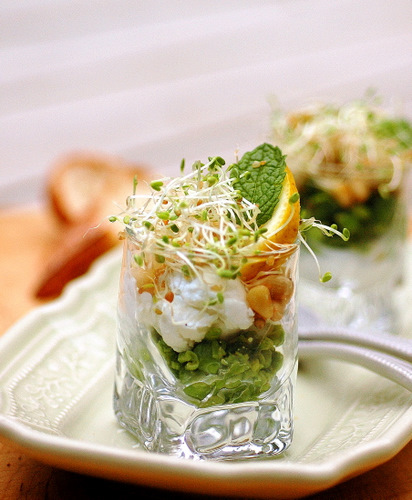 The idea to serve it in a verrine is brilliant! I will try to do this at home 🙂 I do hope I can! I enjoy your posts! 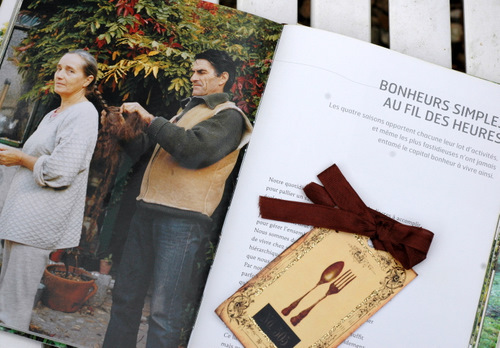 I’m brushing up on my French cooking, studying French too on Babbel.com (http://www.babbel.com). They have a lot of food vocabulary there. It’s cool to learn the cooking and language in tandem. I came here via Taste with the Eyes and I am so glad I did! The recipe has me enthralled and the spring peas are just coming in! I am putting that garden quote everywhere. It is so wonderfully true!